Being a leader is a choice. You can be an out-in-front leader or a behind-the-scene leader. 2. Practice the art of constant self-improvement. A hallmark of leadership is always upgrading your skill set. A leader that is not learning is a leader that will fall behind. What skill do you need to improve on or to strengthen your leadership? If you have not asked this question, your leadership might be slowly deteriorating. 3. Think in terms of opportunity. Henry Ford articulated, “When everything seems to be going against you, remember that the airplane takes off against the wind, not with it.” Too many people are conquered by perceived negative experiences. But there is no such thing as a bad experience. Every experience we’ve had serves us for the betterment of our lives and well-being. People such as Oprah Winfrey, who were abused and who grew up in some pretty scary environments, were able to use their so called “awful experiences” to grow and excel. Often the adversities in our life are disguised as terrible misfortunes, when in hindsight they are our greatest opportunities. Leaders search for the good in seemingly negative experiences. 4. Establish a relationship with a mentor. Leaders know they don’t have all the answers. It’s extremely important to seek help from successful leaders since we can learn from their experiences. You can accelerate your progress and avoid possible pitfalls to your eventual success. After you find a credible mentor, consult with your mentor on a regular basis. Make sure to report your activities and success to your mentor. Keep in mind that your mentor will continue to help you as long as you respect his or her time and knowledge, and you consistently progress toward your goals. 5. Be a mentor to others. Yes, you need a mentor. Yes, you need to be a mentor. Establishing your self a leader means you are willing to help other people become leaders too. How can you coach, mentor and train those on your team to improve their own personal leadership? The late Sam Walton knew this by saying, “Outstanding leaders go out of the way to boost the self-esteem of their personnel. 6. Make tough decisions. Leaders are often the ones that can move forward with making tough decisions that other are afraid to make. Our decisions affect every aspect of life. Our decisions also affect everyone else in our life, too. Our kids, our coworkers, our friends—everyone! Making tough decisions is one of the most important things you can do. You might have to discontinue a product. You might need to eject or severe a relationship with someone that is on your team. 7. Make integrity a cornerstone. Integrity is the quality of being whole or undivided. Quality buildings, space rockets, boats and cars are known to have structural integrity. Great computer software programs are known to have data integrity. So, when we live a life of human integrity we create confidence, credibility, dependability and trust—not only with others, but with yourself. Integrity is always doing the right thing, even when no one is looking. Integrity is when our actions are congruent with our values. Good friends of integrity are honor, truth, reliability, wholesomeness and honesty. Integrity is following through on what you say you are going to do and doing it right. 9. Stand up and speak up. Have you ever been afraid to express your opinion? Have you ever believed your opinion would just fall on deaf ears, that your opinion or ideas were not important enough? What fearful words or phrases are you saying to yourself about your opinions’ validity? We can turn our fears into confidence if we choose. Make the choice to stand up for what you believe in! Don’t allow other opinions squelch your vision, dreams and goals. Follow what Walt Disney said and lived by, “When you believe in a thing believe in. These are just a few ways to strengthen your leadership. Being a leader is a choice. 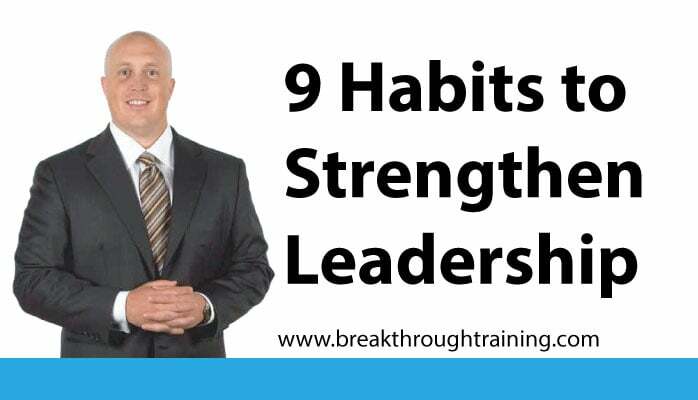 Choose to put into practice a few of these habits for success to strengthen your leadership.